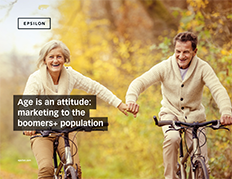 Age is an attitude: marketing to the boomers+ population used Epsilon data to determine that for baby boomers and the silent generation, finances is more important than age. providing advice on how to take action on the findings! Copyright © Epsilon 2017 Epsilon Data Management, LLC. All Rights Reserved.